Ten years in the making, this informative guide to a dozen Los Angeles cemeteries locates the 400 most interesting gravesites in Southern California. Over 270 color photos, informative text, and driving directions guide readers to the graves of L.A.'s most famous and influential citizens. Included are early film stars Rudolph Valentino, Douglas Fairbanks, and Florence Lawrence; along with Cecil B. DeMille and Jesse Lasky. It includes the graves of former slave turned philanthropist Biddy Mason and comic legends Jack Benny, Eddie Cantor, Milton Berle, and George Jessel; even the area's most visited grave, Marilyn Monroe's, is featured. Hi, my new book, Ghosts In The Cemetery is 4 weeks away from being available (correction- Now Available!). It is on the proverbial slow boat from China. The book retails for an amazingly low $19.99 and has 135 pages, 70 large high quality photos on glossy paper and the book is 8.5 x 11 inches in size. The books just arrived today and they are ready to ship. If you want one or more, they are $19.95 each and the postage with Delivery confirmation is $3.50 (for one, two or three books). Include information if you want it signed or prefer a special inscription. You can send a check to Stuart Schneider, P.O. Box 64, Teaneck, NJ 07666 or pay by Paypal to [email protected]. This memoir is the story of our uncle, Frederick Woodward Blanchard, and of the family members who supported and cherished him. Fred, a Boston native, came to Los Angeles (population 40,000) in 1886. A visionary, he quickly entered deeply into the life of his adopted city, and he began a forty-year love affair with the City of Angels that continued right up to the time of his death, in 1928. What’s weird around here? 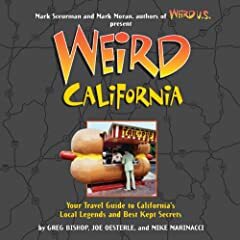 That’s a question Mark Moran and Mark Sceurman have enjoyed asking for years—and their offbeat sense of curiosity led them to create the best-selling phenomenon, Weird N.J. But why should they stop at New Jersey when there’s so much that’s peculiar, odd, and utterly nutty across the whole U.S.? So the two Marks—along with several other writers with a taste for the strange—have focused on some key locales, giving each of them the full “New Jersey” treatment. Spanning the breadth of the country, from New York to California, these are travel guides of a sort, but to the kind of places voyagers will never find on their everyday maps. Instead, they’re chock-full of local legends, crazy characters, cursed roads, and bizarre roadside attractions. So come along and join the fun: Some of what’s out there is disturbing, some hilarious, but all of it is unforgettably…weird. Several of my photographs are included in The Last Laugh, a new book which collects together some of the best examples of cemetery humour. From the cowboy graves of the Old West to the gothic headstones of Victorian England, from the tombs of famous actors and politicians to the final resting places of many ordinary people, here is a unique visual record of funny farewells. 64 pages with 55 photos, hardcover, 6.25 x 5"
"Hollywood Remains to Be Seen" is a fascinating, gossipy guide to the 14 most significant Hollywood-area cemeteries and the final resting places of the movie stars who are buried in them. Arranged as an easy-to-follow tours of the properties, the 14 chapters - one for each cemetery - include histories of the cemeteries and a detailed listing of exactly where more than three hundred stars are buried. "The Big Book o' Graves," a large format book of lists that detail every aspect of celebrity death and grave locations, cross referenced by names, cemetery locations, types of death, stats up the wazoo. An invaluable reference guide for the serious thanatologist as well as the casual grave hunter. This one is hot off the presses - Pre-order it now! "In Hollywood, the dead are the only permanent residents." Join author and grave hunter Steve Goldstein as we dig up 100 years of Hollywood history through extensive tours of Hollywood Forever, Hillside Memorial Park, and Holy Cross cemeteries, including the gravesites and stories of Al Jolson, Aaron Spelling, Cecil B. De Mille, Griffith J. Griffith, John Huston, Rudolph Valentino, Moe Howard, Dee Dee Ramone, Meyer "Mickey" Cohen, Eddie and Toni Mannix, Jack Benny, Bela Lugosi, John Candy, Sharon Tate, and dozens more. 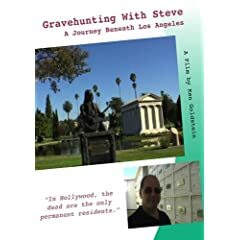 A charter member of the Hollywood Underground - an organization of grave hunters and dead celebrity stalkers who meet regularly in the crypts of Los Angeles to compare notes, and compete to be the first to photograph the latest celebrity grave- Steve explores his background and what lead him to enjoy a hobby others might find morbid. As the author of "L.A.'s Graveside Companion: Where the V.I.P.s R.I.P." and curator of beneathlosangeles.com, Steve's stories entertain as well as educate about Hollywood's history and the private lives of the famous, the infamous, and the just plain dead. The new DVD from my buddy Scott Michaels, "Six Degrees of Helter Skelter," the follow up to the hugely successful "Dearly Departed, Vol. 1," the first feature film documentary from FindADeath.com, produced by Scott Michaels and Tenacity Entertainment. Huell goes in search of some of our most permanent residents in this episode of California's Gold. We'll see where some of TV & Film's most famous animals are resting in peace... and many of them are not where you would think! To purchase a copy of this video, please call 1-800-266-5727. Filmed in Hi-Definition, this feature-length documentary focuses on how and where Hollywood celebs have died, humorously led by Hollywood historian Scott Michaels (E! 's "20 Most Horrifying Hollywood Murders," Dearly Departed Tours, FindADeath.com). The film features 18 profiles, with modern-day visits to the real L.A. locations where the action went down (over 50 locations in all), as well as historical footage, photographs, death certificates and autopsy reports, all supported by meticulously researched details and interviews. Dearly Departed is entertaining, funny, shocking, and loaded with surprising revelations that shed new light on even the most well-known stories, and bring some of the more obscure tales to the screen for the first time ever. The DVD also contains a 15-minute bonus video of Scott Michaels' annual presentation to Hollywood Underground in October 2006. Until the Beneath Los Angeles book is ready for publication, we will be sharing other titles from our library with you. These are all books that we have read and found helpful and/or entertaining. By associating with Amazon.com, the largest retailer of books and music on-line, we are able to offer you these books at substantial discounts, and from a reputable dealer. Please check back often, and see what we've added to the library. Beneath Los Angeles . Amazon.com is pleased to have Beneath Los Angeles in the family of Amazon.com associates. We've agreed to ship products and provide customer service for orders we receive through special links on Beneath Los Angeles. Amazon.com associates list selected books and music in an editorial context that helps you make the right choice. We encourage you to visit Beneath Los Angeles often to see what new items they've selected for you.